Famous for beef and wine, Argentina is the eighth largest country in the World. There’s a certain romance and passion about this place, home to Evita, the Tango and the Gaucho, cowboys of the South American Pampas. 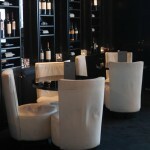 The eponymous restaurant group has, for many years now, served some of the best steak in London and UK. 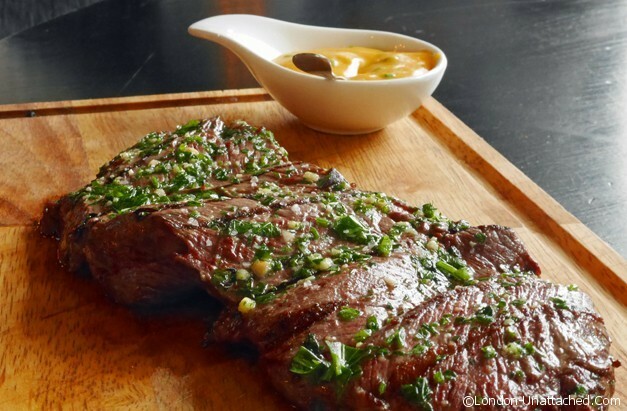 It pre-dates Hawksmoor, Goodmans and others and has always focused on Argentinian beef. Hard to believe that it was founded in 1976. 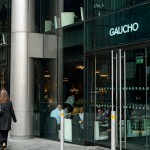 I was first treated to a steak at Gaucho in Piccadilly when I was still at school. Descending into, what seemed at the time, a very adult and glamorous nightclub, walls decorated with cowhide, mirrors and leather, we joined the beautiful people of London. 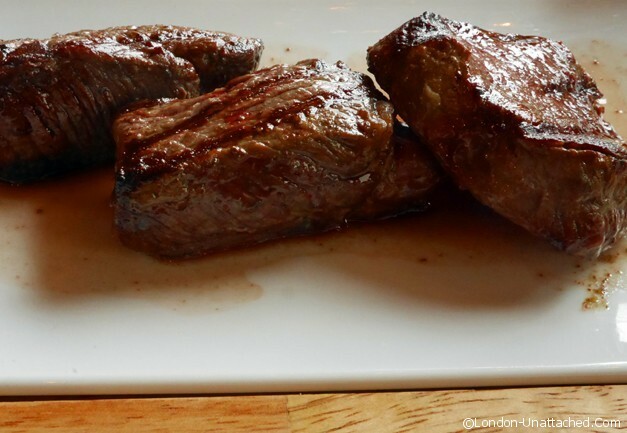 I ate my way through a buttery, melting fillet steak that bore absolutely no resemblance to boarding school suppers. It was The Business. I really can’t remember why I was there. But, I do remember the steak. 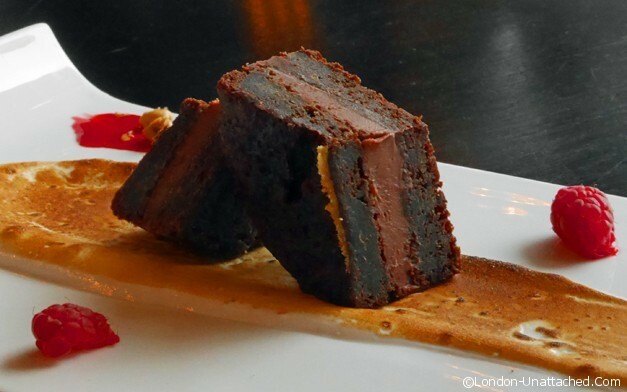 A recent invitation to visit Gaucho Tower Bridge as a guest of the restaurant was welcome. 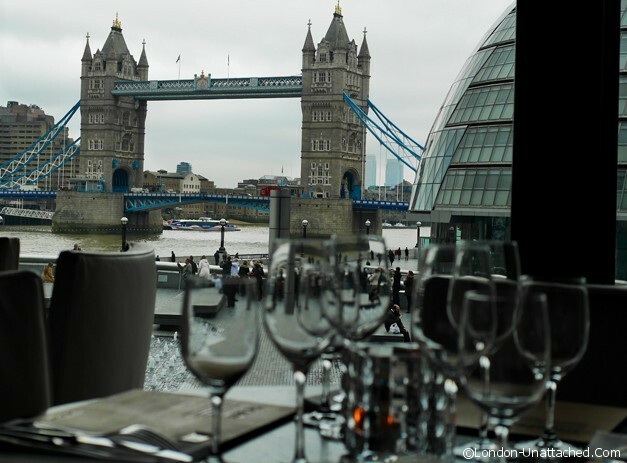 The restaurant has sublime views over the river and Tower Bridge itself. Decor hints at what I remember from Gaucho Piccadilly all those years ago, but with a contemporary feel – flowers, cut glass chandeliers and quirky chairs tucked in the corners. Elegant and comfortable, I could stay here all day. On to the serious matter of food, we did, of course, have to order steak. If you wanted to be truly carnivorously indulgent there are plenty of meat based starters on the menu too, though we both picked fish options. 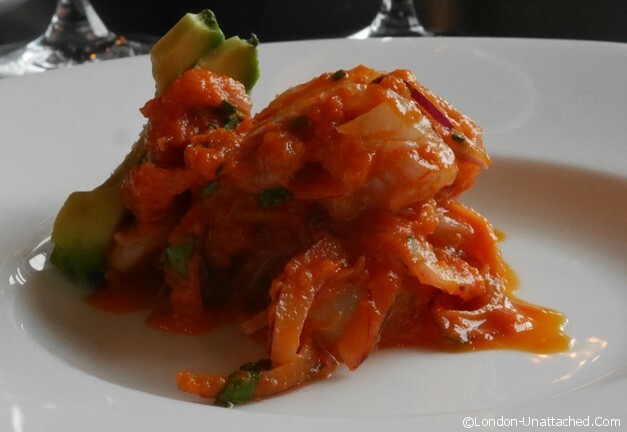 For me, Ecuadorian ceviche, which came paired with a glass of Finca Sophenia 2011 ‘Rosé of Malbec’. Ceviche is a raw fish marinaded in citrus, herbs and spices to produce a light, tangy mixture. It depends on excellent, fresh ingredients and on the palate of the chef to balance the marinade without overwhelming the fish. Here the fish was deliciously flavoured shrimp with a roasted tomato and pepper salsa and a garnish of onion and coriander. I was particularly impressed with the wine. I’ve never tried a Malbec rose before so was unsure if it would work. 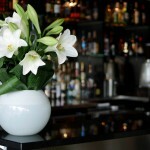 A fresh, light glass of wine, the citrus notes make this wine a great pairing, while the wine is still round and soft. My dining companion’s pan fried scallops may be a classic dish but I suffered just a little food envy at the stunning plate opposite me. 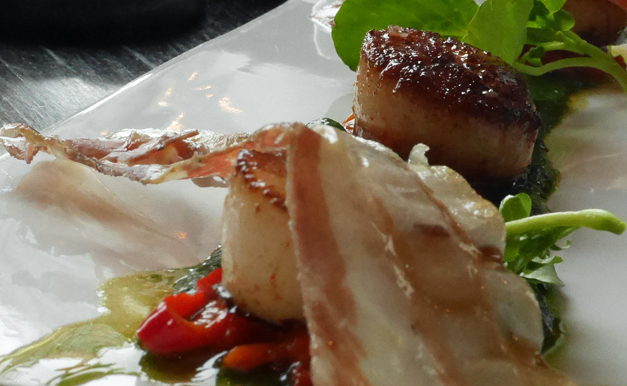 The scallops were served with a watercress purée, smoked pancetta and confit red pepper. ‘Perfectly cooked’ she announced, before polishing off the lot at double quick speed. 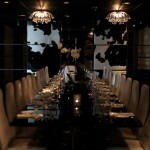 Our mains were a hedonistic tribute to a traditional steak dinner. We couldn’t decide which chips to order, so ended up with one portion of each. A side dish of salad didn’t seem quite enough, so we added some creamed spinach. And, garlic mushrooms of course, just to get that retro steak meal going. Add to that two steak sauces and we would undoubtedly have been full without the addition of 300g or so of prime Argentinian beef. I asked for my Media Luna de Vacio to be rare – and that is just how it was served; meltingly soft from the garlic, parsley and oil marinade. My dining companion’s trio of medallions, described as ‘the most tender and lean cuts of lomo, ancho and lomito cuadril were served as she requested, medium well done. Once again I suffered a bit of food envy as she described the nuances in textures and flavours of the different cuts. We managed to polish off most of the side orders and a couple of glasses of Argentinian red wine. The restaurant offers a fabulous wine matching service so that if you don’t want to try and find the right glass for your dish they will make a recommendation. And then to dessert. I love the combination of chocolate and raspberries, so my choice of chocolate and raspberry alfajores (a milk chocolate and raspberry parfait cake with meringue and crushed raspberries) was easy. And I did enjoy the recommended dessert wine to accompany Amalaya ‘Dulce’ 2013 Torrontés Riesling. 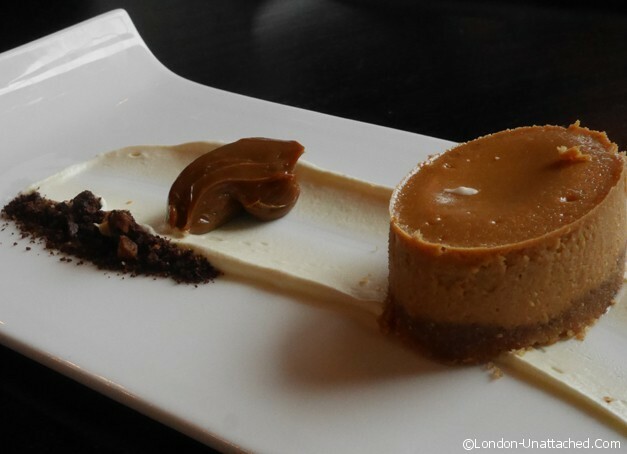 Meanwhile, my companion indulged in the salted dulce de leche cheesecake, a picture on the plate and something which almost excuses the use of the word unctious. 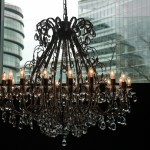 I’d recommend Gaucho at Tower Bridge for the food, the wine, seamless service and stunning views. If a steakhouse can be seen as romantic, this one must win first prize, particularly at night when the bridge is lit up and you can see across the river to the Tower of London. It’s also the perfect place for a long lunch and Gaucho are making it easy for everyone to enjoy just that with a Sunday of sharing platter which includes a whole roasted chimichurri infused chicken, rib eye steak, roast potatoes, Yorkshire pudding, vegetables and a selection of Gaucho’s special sauces. 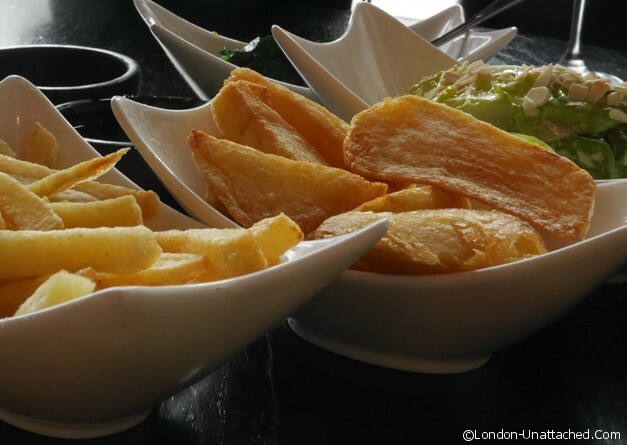 At £18 a head it’s worth taking a break from cooking Sunday lunch and making your way to Tower Bridge. wow.. what a glorious meal. I love meat. I am such a carnivore. I find that the right piece of meat can make the meal. Your photos show off the best of the presentation particularly the desserts. I love the idea of a rose of Malbec. I love Malbec so I would definitely try that rose!